NOTE: As of 3-June-2016, our Instagram support was discontinued. 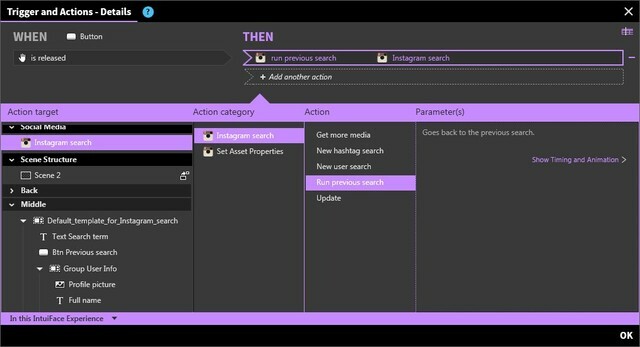 The Instagram interface asset was removed from Intuiface starting with Version 5.5. For information about why our Instagram support was discontinued, see this posting in our User Community. The Instagram Interface Asset enables Intuiface to perform a live Instagram search and then display both the image and video results. 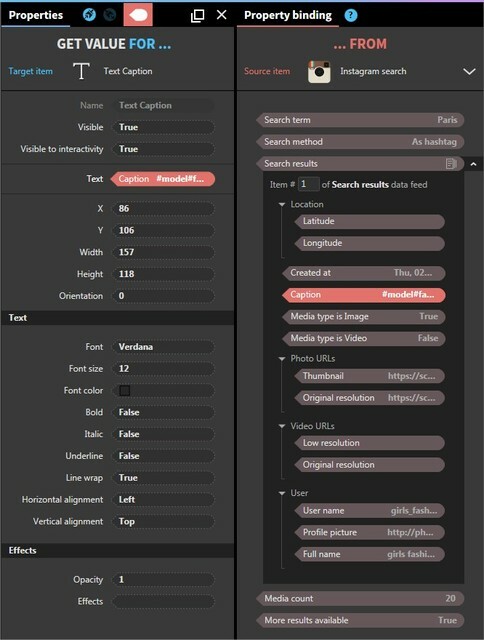 Search term(s) can be determined either at design time or at runtime and the displayed results can be updated on-demand and even manipulated independently. All of the properties below are related to the search query results and - as read-only properties - only visible through a binding panel. More results available: true if more results will be displayed after calling the Get more results action (see below). Search results: data feed containing all results from the search query. The data template article explains how data feeds are represented in Intuiface. No media returned: Raised when the Instagram search returns no results. Result found: Raised when the Instagram search returns one or more results. Search in progress: Raised when the Instagram search is still in progress. 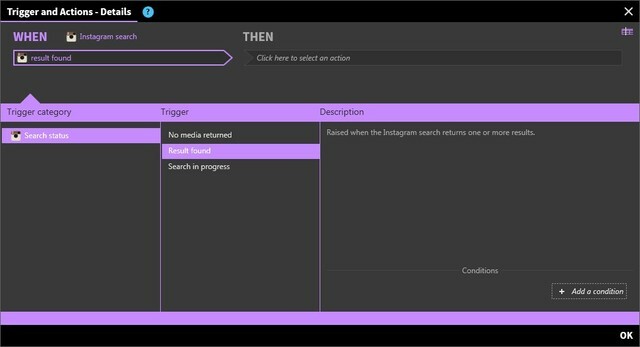 Get more media: Displays the next ten results for the current search. New hashtag search: Runs a new search using the specified search term. New user search: Runs a new search using the specified user name. Run previous search: Goes back to the previous search. Update: Reruns the current search.